There are times when I love going to see a good animated movie, and sometimes not. I didn’t have that ‘not’ problem here with “How to Train Your Dragon 2” because I had taken my nephew 5 years ago to see the first one and had enjoyed it. As with a lot of animated movies..they say they are for kids, and this one definitely is, but they always have a bit of an adult element to them also. And most of the time also a message.. again. also done here. 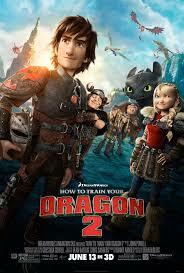 This second chapter of the trilogy of the “HOW TO TRAIN YOUR DRAGON” franchise, take us back to the mystical world of “Hiccup” (v/o Jay Baruchel) and his now faithful dragon “Toothless”. It’s a much different place now as their is peace, love and harmony between the dragons and the villagers. This time around all that is at stake with threats from a new, and very powerful enemy, “Drago” (v/o Dijiman Hounsou). During a flight of fancy, dragon-racing game “Hiccup“ and his friends, “Snotlout” (v/o Jonah Hill), “Fishlegs” (v/o Christopher Mintz-Plasse), “Tuffnutt” (v/o T.J. Miller) twin sister “Ruffnut” (v/o Kristen Wiig), who as always, give us some of the best laughs of the movie, when she goes after the handsome “Eret” (v/o Kit Harrington) and with Hiccup’s now also grown up, girlfriend, “Astrid” (v/o America Ferrera), they discover a fortress made of ice in which they find a ‘mysterious’ woman, “Valka” (v/o Cate Blanchett) whom has spent the past 20 yrs ~ which turns out to be how old “Hiccup” is ~ freeing captured dragons and caring for the injured ones. Turns out that “Stoic” (v/o Gerard Butler) and “Valka” know each other..quite well as a matter of fact as she is “Hiccups” long lost, presumed dead, mother. Cue the violins (and adult part of the movie) here as it’s the emotional scene coming up where they all get back together as a family immediately, of course and fall back in love on sight. “Drago” in the meantime feels that all dragons should be captured and enslaved and “Stoic” and his ever-present sidekick, “Gobber” (v/o Craig Ferguson) immediately want to go to battle, whereas the naive “Hiccup” feels that if he can only meet to speak with “Drago”, he will see his reason and change his mind. But as expected. difficult consequences occur ~ note to parents, younger children will probably not understand this part well, and it leads into what could be an emotionally upsetting outcome, but you will soon see the outcome of this and it ultimately leads to the age-old ramification (and message within the movie) good overcome bad and the weak can defeat the strong with all the right attitude. This is certainly a fun movie, for both adults and kids alike as it’s pretty visually dazzling and I was able to see it in 3D so the action sequences were definitely made fun with that! !